American Queen Steamboat Company’s new Victory I. Victory Cruise Lines, now operated by American Queen Steamboat Company, will offer sailings of the U.S. Eastern Seaboard and Mexico possibly later this year or in 2020 according to John Waggoner, CEO of American Queen, speaking at an event here. American Queen purchased Victory last year and is upgrading its two ships to higher standards. 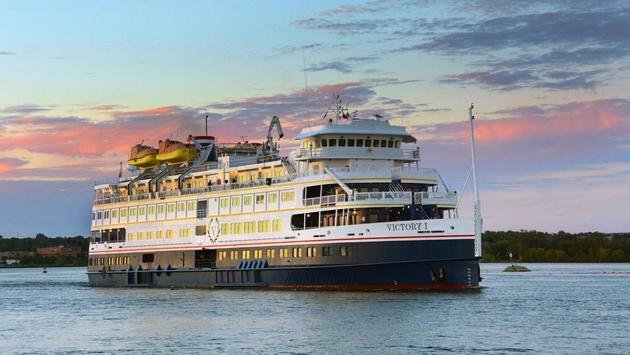 There are no plans to rebrand the Victory I and Victory II said Waggoner, because they are well known in the market and different from the American Queen ships that are U.S.-flagged and paddlewheel vessels. The Victory ships sail on the Great Lakes with many trips between Toronto and Chicago; and between Detroit and Montreal. Waggoner said the plans by the previous owners to sail to Cuba would not be followed for now. He said that plans are being formulated to have East Coast sailings to Florida and then on to the Yucatan. Several options are being considered involving Cancun, Playa del Carmen and Campeche. The product is now being worked on and sailings will begin when plans are complete. Waggoner said the American Queen reservations office is being expanded so that travel agents could book the Victory vessels in the same way they do the American Queen boats. The Victory ships, said Waggoner, have a similar 19th century feel as the American Queen vessels. They will feature “edutainment” similar to that found on American Queen. He said the company has no plans to reach out to a younger demographic because the target demographics are already so large. That is singles and couples 55 and over who are river cruisers. He said more adventure options are being added to the sailings in the Pacific Northwest. That includes cycling, fishing and more. Other changes being considered by the line, said Waggoner, were eliminating the spa on the American Queen in favor of having more space devoted to shore excursions; and having a significant art program on the fleet.